Dammit, NASA. 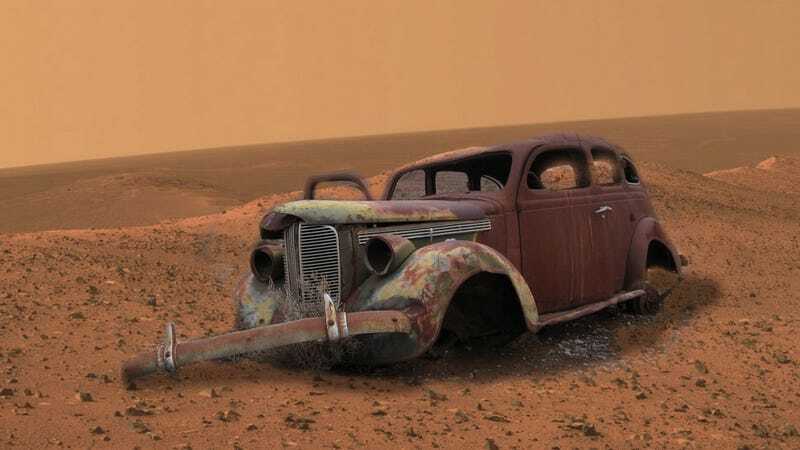 Here we are thinking the arid, cold wasteland of Mars would be a perfect place to one day store and enjoy all our vintage cars, free of all the old-car hazards of earth, and then you had to go and find salt water, of all things. That’s going to destroy all our old shitboxes. Mars, with its lack of a DMV, heavily-patrolled roads, restrictive import laws, or even emissions regulations, seemed like a heaven for all of us old-car hoarders. We figured it’d just be a few years before we could load all our cars up into pressurized cylinders, rig up some crude sort of oxygen-supply system for the carbs, and head out on some Aldrin-cycler ship and start a glorious new car-filled life on Mars. And then you had to find salt water. Here we thought would be the ideal, desert-arid environment to keep cars alive — like the US Southwest, but without the insane Craigslist sellers. But now that there’s salt water around, we just know everything’s going to rust into a pile of crap as soon as we land. Thanks a lot, NASA. Would it have killed you to find some rivers of gasoline instead? Would that have been too goddamn hard?